Cordless drills have become very good but often a corded drill will be a better choice. The DEWALT DWD112 has been one of the most popular drills for quite some time. The DWD112 is not jam-packed with features but it is a versatile drill with all the features you need for normal drilling. Thanks to the heavy-duty 8-Amp motor, the DEWALT DWD112 is a powerful drill. The variable speed makes it possible to drive screws. The DEWALT DWD112 features a keyless chuck and reversible motor. At 4.1 pounds it is not really a lightweight drill but it is manageable for most people. A minor shortcoming is that the DWD112 has no built-in work light. On the other hand, it is has a built in bubble-level. The DEWALT DWD112 comes with a limited three-year warranty, 90-day money-back guarantee and one-year free service contract. Note that you only get a manual with the drill. For more information, you can download the DEWALT DWD112 User Manual from here. The customers have given the DEWALT DWD112 drill an average rating of 4.7 out 5. Quite clearly, most users are very happy with their DWD112 drill. Virtually everyone said that it was a good powerful drill. Almost all customers thought that they had got good value for their money. Customer comments were paraphrased to save space. Here you can read DEWALT DWD112 customer reviews. The DEWALT DWD112 Drill is a good drill and the price is very reasonable. It is a versatile drill, clearly one of the best if you are not looking for a cordless model. Quite clearly, you get very good value for your money, highly recommended. This entry was posted in Corded Drill Reviews, Dewalt on February 28, 2014 by Steve. The Makita LXDT04Z is a compact and lightweight (only 2.5 lbs without battery) impact driver. Despite its small size, it is a powerful impact driver. The Makita 4-pole motor delivers 1,420 inch pound of torque. Thanks to the variable speed (0-2,300 RPM & 0-3,200 IPM) the Makita LXDT04Z can be used for a wide range of fastening tasks. The 18V LXT lithium-ion batteries (sold separately) are very powerful despite being lightweight. The rubberized soft grip makes the impact driver comfortable to operate. The Makita LXDT04Z is engineered to be dust and water resistant. It has a built-in LED light which illuminates the work area. All in all, it is a tool well suited for professionals. There are plenty of very good impact drivers on the market, the Makita LXDT04Z is quite clearly one of them. The Makita LXDT04Z impact driver is covered by a 3 year warranty. Note that you only the get LXDT04Z impact driver, battery and charger are sold separately. If you already have Makita lithium-ion batteries (BL1815 or BL1830) and charger, then you get excellent value for your money. The customers have given the Makita LXDT04Z a very impressive average rating of 4.9 out of 5. In other words, the customers were very happy with the LXDT04Z impact driver. Virtually everyone said it is a powerful but lightweight impact driver which is very easy to use. For more details about the Makita LXDT04Z impact driver, check out the LXDT04Z Owner’s Manual. Note that you only get the impact driver and a tool belt clip (Makita 346449-3), no battery, no charger. If you need batteries and a charger, you can have a look at the Makita LXDT04 Impact Driver kit here. You get two lithium-ion batteries, a rapid charger and a case. You can buy the Makita LXDT04Z Impact Driver at Amazon.com, taking advantage of Amazon’s low prices and excellent customer service. Click here to go to Amazon.com and have a look at the Makita LXDT04Z. This entry was posted in Impact Driver Reviews, Makita on January 4, 2014 by Steve. 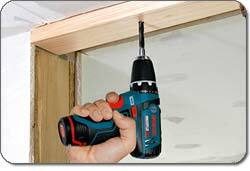 The Bosch PS31-2A is compact and lightweight (only 2.1 pounds) drill/driver. Despite the small size, it is a powerful drill. Given the nice price, you get good value for the money. The Bosch PS31-2A is a very versatile drill/driver, it has two speed ranges, keyless chuck and a reversible motor. It has 20+1 clutch settings and a built-in LED work light. The drill is well balanced and is easy to operate. The PS31-2A does not have any significant shortcomings but since it is a 12V drill, it is not the best choice for heavy duty tasks. But it has no problems handling DIY tasks around the house. The price may not look cheap, but you get two lithium-ion batteries, a charger and a carrying case with the PS31-2A drill/driver. Thanks to the two batteries and the fast charger, you can work all day long. The Bosch PS31-2A is backed by a 3 year warranty, the batteries by a 2 year warranty. The customers have given the Bosch PS31-2A an average rating of 4.4 out 5. In other words, most people were happy with their PS31-2A. Apart from a few exceptions the customers said the Bosch PS31-2A was lightweight, compact and powerful. Yes, it is relatively expensive but most of the customers thought that they had got what the paid for. If you are looking for a compact and lightweight drill, then you should have a closer look at the Bosch PS31-2A 12V Drill/Driver Kit. For its size it is amazingly powerful. You can buy the Bosch PS31-2A Drill/Driver from Amazon.com, taking advantage of Amazon’s low prices and excellent customer service. Click here to go to Amazon.com and have a look at the Bosch PS31-2A. Two speeds and a 3/8-inch chuck accommodate 90 percent of common applications. Compact design ideal for working overhead and in tight spaces. With this small drill/driver you can work anywhere, anytime. An integrated LED illuminates dark corners and low-light areas so your visibility is never compromised. In addition to providing illumination, this drill driver is also trademarked with Bosch’s Electronic Cell Protection (EPC), which extends the run time and life of the tool. The Bosch 12-volt max drill/driver is backed by Bosch’s ProVantage warranty. The first year is a tool replacement guarantee, and the second and third year include the free tool repair pledge. The tool will be under warranty for three years and the batteries for two years. 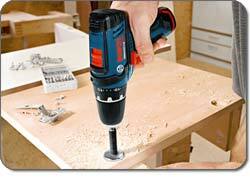 This entry was posted in Cordless Drill Reviews on December 20, 2013 by Steve. The Hitachi DB3DL2 is a compact and lightweight screwdriver. For its size, it is powerful. It is only 10.55″ in length and weighs less than one pound, making it very comfortable to operate. The DB3DL2 has a dual position handle, allowing straight-grip or pistol-grip operation. The Hitachi DB3DL screwdriver comes with a quick-change 1/4″ hex chuck with bit lock, making it quick and easy to change bits. It has an integrated LED light, making it easier to work in dark areas. The DB3DL2 has 21 clutch settings plus 1 drill setting as well as two speed settings. All in all, it is a very versatile electric screwdriver. The price is very reasonably, giving you good value for your money. The DB3DL2 screwdriver uses Hitachi’s 1.5Ah 3.6V lithium-ion batteries. They are 50% lighter than similar Ni-Cad or NiMH batteries. The batteries take only 30 minutes to charge. You get two batteries with the screwdriver, so you can work non-stop. The Hitachi DB3DL2 screwdriver does not have any major shortcomings. But bear in mind that while the DB3DL2 is powerful for its small size, it is not suitable for heavy duty tasks. For heavy tasks, you need a more powerful screwdriver than a 3.6 Volt model. The DB3DL2 is covered by Hitachi’s Lifetime Lithium-Ion tool warranty and 2-year Lithium-Ion battery warranty. The customers have given the Hitachi DB3DL2 screwdriver an average rating of 4.5 out of 5. Virtually everyone said that the DB3DL2 is lightweight and easy to use. Almost everyone thought that they had got good value for the money. Some customers had noticed that for heavy tasks, the DB3DL2 screwdriver is not really powerful enough. Apart from that, very few had anything negative to say about the Hitachi DB3DL2. The Hitachi DB3DL2 Screwdriver is good and versatile screwdriver. You can find cheaper cordless screwdrivers but the Hitachi DB3DL2 is certainly well worth having a closer look at. It is compact, lightweight and has plenty of power. You can buy the Hitachi DB3DL2 Screwdriver at Amazon.com, taking advantage of Amazon’s low prices and excellent customer service. Click here to go to Amazon.com and have a look at the DB3DL2 screwdriver. This handy cordless screwdriver is the ideal tool to easily complete everyday projects around the home or shop. It is perfect for tightening or loosening fasteners or drilling holes in odd or tight spaces. Around the home, the DB3DL2 can be used for hanging blinds, removing or installing light fixtures and switch plates, assembling furniture, hanging pictures, working on intricate hobby projects and to easily and quickly complete any odd job. Professional users reach for this tool as a convenient timesaver in applications like handy work, computer repair, appliance and copier maintenance and much more. This entry was posted in Cordless Screwdriver Reviews on December 11, 2013 by Steve. The Milwaukee 2691-22 Combo Kit is an excellent combination for professionals. Both the drill (Milwaukee 2601-20) and the impact driver (Milwaukee 2650-20) are lightweight but very powerful tools. The combo kit is not cheap but you get what you pay for, one of the best combo kits on the market. Of course, you don’t need to be a professional to use the Milwaukee 2691-22 Combo Kit, it can handle all DIY tasks around the house as well. Thanks to the fast battery charger (30 minutes) and the two lithium-ion batteries included in the kit, you can work non-stop. Both tools in the kit come with an impressive 5 year warranty. The customers have given the Milwaukee 2691-22 Combo Kit an average rating of 4.5 out of 5. Quite clearly, most customers were very happy with their combo kit. Virtually everyone thought that they had got very good value for their money. A few customers were not happy with the soft bag with seems to have replaced the hard case. The Milwaukee M18 2-tool combo kit includes the Milwaukee M18 lithium-ion 1/2-inch compact drill/driver, M18 lithium-ion 1/4-inch hex compact impact and convenient contractor bag. Examples of innovation include the Milwaukee 4-pole frameless motor, lightweight durability, built-in LED lights, battery fuel gauges and variable speed triggers. When you need power, precision and superior performance in an ultraefficient package, you can’t afford to buy anything but heavy duty. Backed by the confidence of a 5-year warranty, the M18 2-tool combo kit is the essential tool arsenal for the enduring professional. The Milwaukee M18 Lithium-Ion Compact Drill Driver is the most powerful tool in its class with 400 in./lbs of torque. With over 100% more grip for bit retention than other leading brands, plus more run-time and impressive compact size and weight, the M18 lithium-ion high-performance drill driver minimizes downtime and worker fatigue. Featuring adjustable speeds ranging from high speed RPM of 1-1,800 and low speed RPM of 0-450, the M18 lithium-ion compact drill driver allows you to apply concentrated power for accuracy and professional results. The M18 drill driver also has 24 clutch settings, weighs 5.3 pounds and includes a side handle for compactness, comfort and control. The Milwaukee M18 lithium-ion compact drill driver offers endless applications including running wire, drilling metal to run conduit, conduit clamps, running copper pipe, Pex, anchoring pipe hangers, running pipe through wood, setting duct anchors, drilling pilot holes ductwork, fastening duct and general fastening. The Milwaukee M18 1/4-inch hex compact impact driver weighs a mere 3.5 pounds and is 5-3/4 inches, making it compact, yet extremely powerful. Other features include a battery fuel gauge, which displays remaining run-time, and a bright LED light for pinpoint illumination on dark jobsites. The Milwaukee M18 1/4-inch hex compact impact driver has a variety of applications including fastening hex self-tapping sheet metal screws, 5/8-inch and 3/4-inch pipe couplings, outlet boxes, panel boxes, conduit clamps, pipe hangers, pipe clamps, switch plates and general fastening. Milwaukee is the leader in lithium-ion technology, launching the first lithium-ion system in 2005 and the first backward compatible lithium-ion in 2006. Perfecting the formula in 2008, Milwaukee’s lithium-ion batteries are 65% lighter, 50% smaller and store more than 30% more power than “compact” NiCd batteries. They also feature a fuel gauge that lets you know when to recharge, reducing downtime. Select M18 models feature the 18-volt XC high-capacity lithium-ion battery pack that offers increased run-time with 40% less weight than an 18-volt NiCd battery. Featuring Milwaukee’s digital power management to help ensure optimal battery life and run-time, the 18-volt XC high-capacity lithium-ion battery pack protects the battery and tool during the toughest jobsite application. To combat on-site problems like bent/broken terminals, damaged clips and broken welds caused by use and abuse, Milwaukee lithium-ion batteries are equipped with recessed terminals, slide pack dual clips and over-molded housing, and integrated welded frame and cell separators. This entry was posted in Combo Kit Reviews, Milwaukee on November 21, 2013 by Steve.